This Japanese style outdoor bench was built as a memorial for one of my clients. The Bench is designed to seat four adults. A removable plaque in the center of the bench back rest can be Laser Engraved with your loved ones Name and Dates. 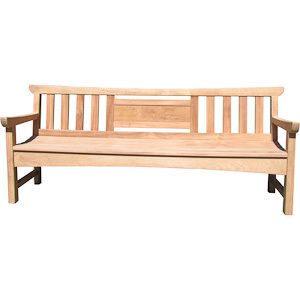 The bench is made from African Mahogany and designed to endure the weather. The bench can be customized to meet your needs with other wood types and sizes. Please send your inquiry to Sebago Furniture for a price and delivery. The bench as shown with two lines of lettering.